On 12 November 2018 - Assistant to the Rector for International Affairs of Thammasat University, Asst. Prof. Dr. Supranee Lisawadi welcomed Prof. Dr. Yogita Abichandani from Management Development Institute (MDI), West Bengal, India. This visit aimed to discuss about possibility for both universities’ collaboration. The information will be pass on to related faculties for further consideration. On 7 November 2018 - Thammasat University Vice Rector for International Affairs, Assoc. Prof. Dr. Kitti Prasirtsuk and Associate Dean for Administration and International Affairs of Faculty of Medicine, Prof. Dr. Prakitpunthu Tomtitchong welcomed Dr. Leonard Azamfirei, Rector of University of Medicine and Pharmacy Sciences and Technology of Targu Mures, Romania. This visit aimed to discuss about agreements for both universities’ MoU, which will be sign in December, 2018 at UMFST. In addition, both sides discussed on student and teacher exchange and academics collaboration. On 9 November 2018 - Asst. 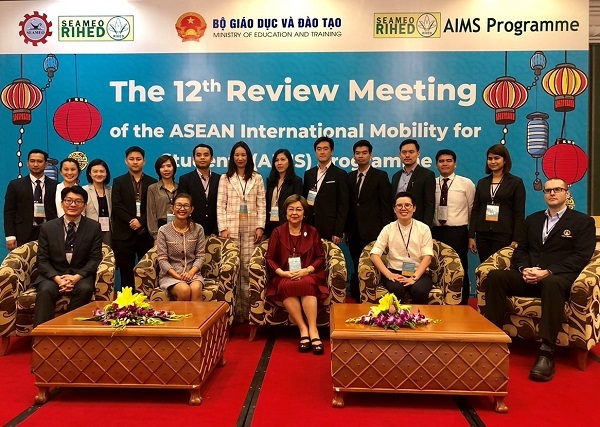 Prof. Dr. Supranee Lisawadi, Assistant to the Rector for International Affairs of Thammasat University Participated the 12th Review Meeting of ASEAN International Mobility for Students Program (AIMS) at Hanoi, Vietnam during 7 - 9 November 2018. The proposed of this meeting aimed were to exchange the ideas and experiences, and to overcome challenges through project implementation, project evaluation as well as project planning.